StarWars.com has a new excerpt from Thrawn: Alliances revealing Padmé’s inclusion in the story. Jason Fry shared a look at the cover of his upcoming book Tales from Vandor. Solo: A Star Wars Story: Tales from Vandor will be out on September 11, 2018 coming in at 128 pages in replica journal format. Disney is putting out some new illustrated Forces of Destiny books. There’s Forces of Destiny: Strength and Hope slated for August 20, 2019 which is a 208 page paperback. And there’s Forces of Destiny: May the Force Be with Us slated for January 29, 2019 which is a 208 page paperback. Ben Acker and Ben Blacker have a new book coming out in there Join the Resistance series called Attack on Starkiller Base. It will be out on July 31, 2018 in hardcover (208 pages). Edelweiss has a listing for a book called The Star Wars Archives: 1977-1983. This 600 page hardcover is being edited by Paul Duncan and covers the original trilogy. Lucasfilm Press is putting out a 304 page hardcover called Star Wars Galactic Adventures. It’s slated for an October 2, 2018 release. This collection of 18 all-new illustrated stories for young Padawans spans the entire Star Wars saga, and features everyone’s favorite heroes and villains, such as: Darth Maul, Yoda, Anakin Skywalker, Obi-Wan Kenobi, Darth Vader, Princess Leia, Chewbacca, Luke Skywalker, Han Solo, Lando Calrissian, R2-D2, C-3PO, Poe Dameron, BB-8, Rey, Finn, Captain Phasma and Rose Tico! 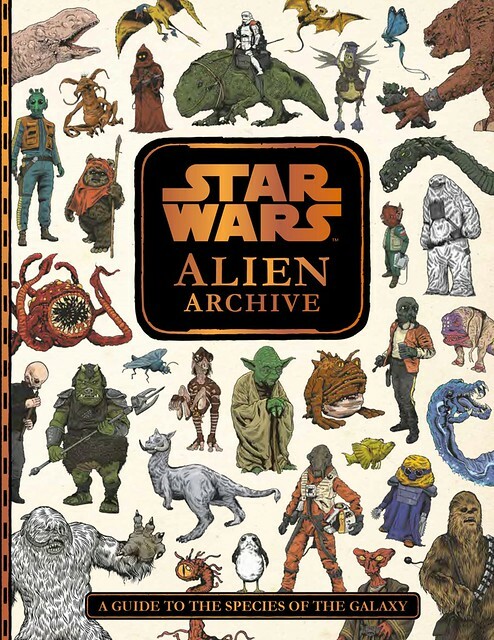 Star Wars: Alien Archive has a new cover. This is slated for an April 2019 release. In the Flight of the Falcon series, Pirate’s Price by Lou Anders and Annie Wu will be out on January 8, 2019 in hardcover (224 pages), and Lando’s Luck by Justina Ireland and Annie Wu will be out on October 2, 2018 in hardcover (176 pages). DK is releasing an updated version of Star Wars: The Complete Visual Dictionary which will be out on September 4, 2018 and will be coming in at 352 pages (hardcover). 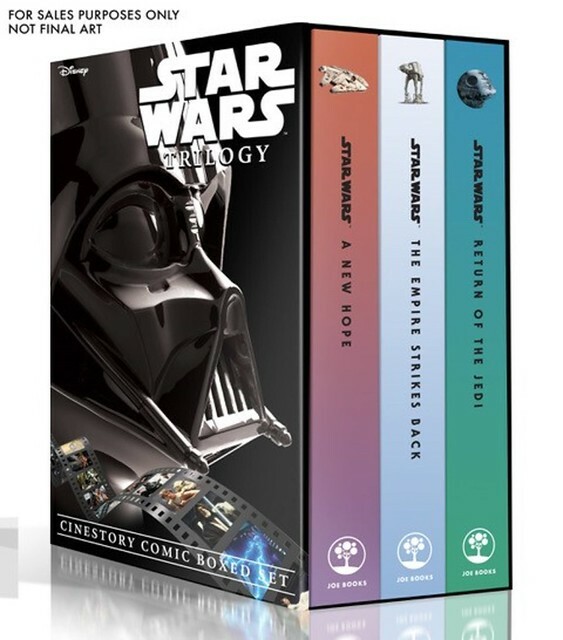 There is a cinestory comic boxed set for the Star Wars Trilogy coming out on September 24, 2019 being put out by Disney. This 400 page paperback set will have a volume for each of the original three films. And capping off lit news, there’s The Overstreet Price Guide to Star Wars Collectibles. The 418 page paperback will be out on November 20, 2018. Since the first film debuted in 1977, Star Wars has dominated the collecting landscape like no other franchise. With record prices set in world of action figures, and the spirited pursuit of movie posters, comic books, video games, novels and other niches showing no end in sight, the team behind The Overstreet Comic Book Price Guide has turned its attention to The Overstreet Price Guide To Star Wars Collectibles. In addition to detailed pricing, this volume will be packed with insights and collecting tips from experienced enthusiasts, dealers and more! IDW will be doing a Solo graphic novel adaptation which is slated for November 20, 2018 (80 pages, trade paperback). Alessandro Ferrari will be writing it. The panelists for the SDCC Star Wars: The Clone Wars panel have been revealed – Dave Filoni, Athena Portillo, Kevin Kiner, Ashley Eckstein, and Matt Lanter. Timothy Zahn will be at Interabang Bookstore in Dallas, TX at 7:00 PM on July 23rd. Timothy Zahn will be at Tattered Cover Bookstore in Denver, CO at 7:00 PM on July 24th. Timothy Zahn will be at Barnes & Noble/Commons at Sugarhouse in Salt Lake City, UT at 6:00 PM on July 25th. Timothy Zahn will be at Powell’s Books at Cedar Hills Crossing in Portland, OR at 7:00 PM on July 26th. Star Wars Rebels has been nominated for three 2018 Emmy awards: outstanding music composition for a series, outstanding children’s program, and outstanding sound editing for a comedy or drama series. The Solo home video release is rumored to be September 25th. Beyond Star Wars, Indiana Jones 5 is being pushed back from 2020 to 2021. Gentle Giant will have exclusive Star Wars enamel pins available at SDCC. Pre-orders for the Hot Toys Anakin Skywalker are up for those who won’t be going to SDCC. Sideshow has a preview of their Boba Fett Mythos figure. Jedi News has a look at the Forces of Destiny SDCC merch.